This will be a 2 part series with a downloadable interview guide! Figuring out where to begin your journey is intimidating. When I was pregnant with my daughter, I was all over Google trying to answer just this question! I wrote this post because of that experience so you can go in to any interview knowing what questions to ask. These are questions you can ask in e-mail, or over the phone, to get a sense for a doula's credentials. 1- What training have you had, and through whom? CAPPA, DONA, Birth Arts International, and Still Birthday are all certifying agencies (and there are more, if they give you another, Google it!) that have solid programs for teaching doulas the ins and outs of our trade. Ask for their certificate, and possibly follow up this question with "What Continuing Education Credits have you taken?" 2- Are you certified. Why did you choose to certify (or not certify)? Doulas can become certified by their training organization, taking the training does not a certified doula make, though! Many organizations have requirements that include attending a specific number of births and obtaining reviews, extra reading, online training courses, attending lactation and birth classes, etc. Many doulas have done all of this, but choose not to certify because of the high cost of obtaining and maintaining certification through a certifying agency. One is not necessarily better than the other. 3- How many births have you attended, where, and what is your service area? Zero is a fine answer, 100 is a fine answer. It's all about your personal connection to that specific doula, but with experience comes an innate knowledge and care you can't get from a book. A Doula who's attended no births will have no reviews so you're hiring someone without reference, which is something to consider. You will want them to be available in your area, at your preferred birth setting (hospital, home, or birth center). If you are planning on moving while pregnant, make sure your doula also provides service to your new area! 4- do you have references of recent past clients? Many doulas have satisfied customers, so ask! They may be able to point you towards written reviews online, or give you contact information for clients. If you contact someone via phone or e-mail, clearly state you obtained their information from the doula, and could they provide an account of their experience with them. Was the doula punctual, respectful, easy to get a hold of? 5- What are your fees and what do they include. Do you take payment plans? To avoid sticker shock, most doulas in most areas of New England should be charging 500-1500 for their services depending on experience and additional services offered. If you hire a doula earlier in pregnancy, most will offer a payment plan to help ease payment. What should their services include? Every doula is different, but they should provide at least one Prenatal meeting (not including an in-person interview) and one postpartum meeting, 24 hour on call service around your due date, a back-up doula, up to 24hrs continuous labor support, phone and email support up to and after birth. Additional services may include: Photography, Placenta Arts, Massage (from a trained massage therapist), Reiki, Yoga instruction, henna, and many more! 6- Do you have a sample contract I can review? A contract protects you, and your doula and spells out specifically what the expectations are for a great number of situations. I would never recommend hiring a doula without a contract. 7- Are you available for my due date? How many clients do you take per month? Your due date is not set in stone, make sure they are available for the month surrounding your due date. A busy doula is a great thing, but if she's to busy, she may miss your birth. Make sure, if you hire a doula with a very full schedule, that you're able to meet and connect with her back-up doula as well. You're not allowed to not allow me! And I hear this all the time, "They wont let me" "I'm not allowed to" "They said I can't" and I just want to tell all of you, YOU are the boss of your birth. Do you want to labor in the tub, eat and drink, immediate skin to skin, no newborn tests for a certain time, or delay vaccines that is your right. Doctors and nurses can make suggestions based on their medical knowledge but they are just that, suggestions. YOU are in the drivers seat, and you are making the final decisions. The best thing you can do to avoid being bullied into a birth you don't want (notice I didn't say c-section, or natural is best!) Is to be educated and understand your choices, and WHY medical staff offer the interventions and advice they do. One thing to understand is it takes upwards of 10-20 years before something is seen as a best practice, and then implemented in hospitals and doctors offices. One website that helps expecting parents wade through information to make informed choices is Evidence Based Birth They have articles for free, based on scientific research for pregnant parents. Hire a doula you trust! There is so much information out there, sometimes its best to have someone who can help guide you through all your choices in an unbiased way. My ideal birth isn't going to be your ideal birth, so make sure you choose a doula that isn't coming in with their own biases based on their personal view of an "ideal birth". You can ask some open ended questions like "What do you feel is an ideal birth?" "Why did you become a doula" "How do you feel about XYZ (insert c-section, epidural, vaccines, ect)" and really listen for bias in their answers. Why do I need a doula at my c-section? It's the comment I get most often: "I'm having a c-section, I don't need a doula"
This is probably a term you've seen tossed around in Facebook groups and Baby Center chat rooms, but what is it really, how do you achieve one, and lastly WHY? Here are a few changes some hospitals have made to make the most common surgery in the United States more family centered. EKG monitors are placed elsewhere, not on the chest. 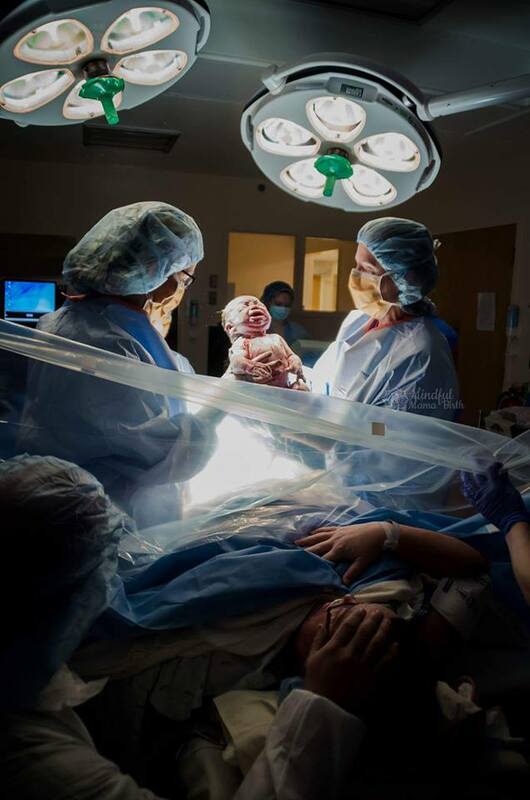 Doula or other birth partners allowed in to photograph procedure. So how do you achieve a gentle cesarean? Firstly, finding a practitioner that is on board with a natural c-section is key, and then reviewing hospital policies regarding all of the items above, you will find a lot of the decisions are up to your anesthesiologist rather than your OB, so having an OB who will advocate for you is ideal. That sounds like a lot of work, right? Having a doula is the best way to help navigate those choices. Often times doulas are familiar with OB's and practices that are more natural minded, and which hospitals offer what services from the best food to NICU/Special Care Nurseries. Why have a gentle cesarean? A healthy baby is what's most important right? It's what we hear time and again "at least my baby is healthy". The guilt and shame that can surround mom's who have had to have a c-section is tough, and can lead to postpartum depression. Creating a birth environment that is family centered, emotionally supportive, and as close to the experience of a vaginal birth as possible all help with getting the best start for mom, baby and family. Doula's can help you wade through the deep emotions of having to choose a c-section whether you know leading up to birth or it's an emergency c-section we are there to help you process emotions and give evidence based support so you can choose what's best for your family. Doula's also help families prepare for the postpartum time, when caring for yourself and a new baby is incredibly difficult. Major abdominal surgery leaves new moms with lots of restrictions on movement, lifting, traveling ect and having a doula who can assist in the postpartum period is a huge help. We're also on the front line of getting new moms connected with the community, mom's groups, support groups, therapy if its needed, and many other services. When I learned I was pregnant, I knew I wanted a midwife assisted home birth. Unfortunately, as my pregnancy progressed we learned due to a short cervix it was best to be in the care of an OB and deliver at a hospital with a NICU. I immediately knew I wanted a doula to attend my birth with me. During my labor, I failed to progress and the doctor recommended a c-section. When I asked about skin to skin in the OR I got a lot of negative talk from the Doctor and nurses, but I wasn't to be turned away. Per what my doula had discussed with me previous to labor I simply said "If Catholic Medical Center can do gentle cesareans, why can't you?" Advocating for myself was what turned a corner with the staff, and I was able to hold my baby immediately upon birth in the OR. My doula had prepared me for this outcome, helped me process my feelings of self doubt and was integral to me getting the help I needed postpartum.